Sony has added a new camera to its line of Handycam: HDR-GW77V. This compact machine can operate underwater at depths of 4.8 meters. In terms of features, GW77V can record 20.4 resolution image and Full-HD video. The camera has Touch Screen 3 which makes playback movie and picture viewer more Interesting and easy. Touch features still function normally when you soak your water. Underwater mode will automatically change the white balance to keep the natural colors when shooting image. 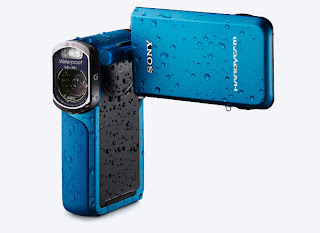 Handycam HDR-GW77V will be sold later this month for $700.